I made this birthday card for one of my nieces. It uses another of the images from the Fairy Celebration stamp set. The card is made from an A5 piece of Peekaboo Peach cardstock, layered with Soft Suede cardstock and a variety of paper from the In-Colour DSP stack. I used a lot of dimensionals! 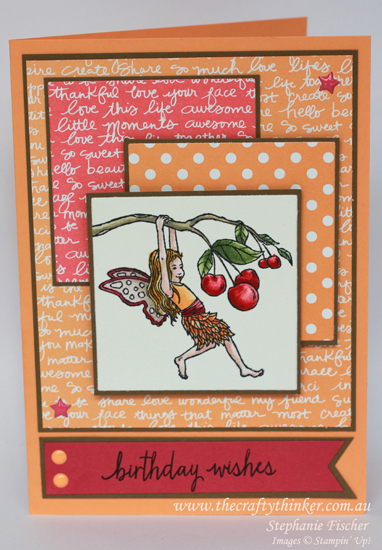 The greeting is from the Build a Birthday stamp set and is stamped in Basic Black onto Flirty Flamingo cardstock. I made the banner ends with the Triple Banner Punch. I stamped the image in Basic Black onto Shimmery White Cardstock and watercoloured it using Peekaboo Peach, Flirty flamingo, Rose Red, blushing Bride, Sahara Sand, Delightful Dijon, Wild Wasabi and Garden Green inks. It's a shame it doesn't show up in the photograph but there is a coat of Clear Wink of Stella on the wings so that they shimmer. I used a lot of dimensionals!